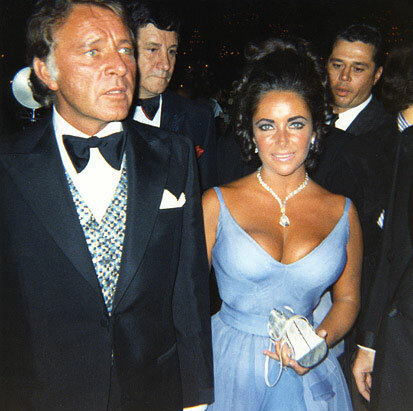 It was a love story for the ages when Hollywood goddess Elizabeth Taylor married Richard Burton. Their iconic relationship is unveiled in the new book, Furious Love: Elizabeth Taylor, Richard Burton, and the Marriage of the Century, by Vanity Fair contributing editor Sam Kashner and co-author Nancy Schoenberger. For more information from what is sure to be a best-seller, check out the press release below. New York, N.Y.--For the first time, Elizabeth Taylor makes public the love letters she received from Richard Burton during their iconic relationship. The only letter she considers too personal to share with the world was written by Burton just days before his death, and she still keeps it in her bedside drawer. It was read to Vanity Fair contributing editor Sam Kashner and Nancy Schoenberger, and in it, Burton tells Taylor he wants to come home. In the letter, according to Kashner and Schoenberger, you can hear Burton's voice. He was not unhappy, he wrote to Elizabeth, but he had been happiest with her. No one else could know what their lives had been together. Was it possible? Could there be another chance? For him? For them? Mailed on August 2, 1984, it arrived in Bel Air, California, a few days after Burton's untimely August 5 death and was waiting for Taylor when she returned from London, after attending his memorial service. She unfolded the letter and read it with trembling hands, according to Kashner and Schoenberger, authors of the forthcoming book, Furious Love: Elizabeth Taylor, Richard Burton, and the Marriage of the Century (HarperCollins, 2010). Taylor has decided to share the letters so that the world will know the place he held, and continues to hold, in her heart: "Richard was magnificent in every sense of the word," she tells Kashner and Schoenberger. "And in everything he ever did.... He was the kindest, funniest, and most gentle father. All my kids worshipped him. Attentive, loving--that was Richard ... from those first moments in Rome we were always madly and powerfully in love. We had more time but not enough." In Burton's numerous letters to Taylor--he admits in them, and in his diaries, that he wishes he had chosen the life of a writer--he describes his infatuation, love, and need for her. In Taylor, he had found the embodiment of all the women he'd ever known. "If you leave me I shall have to kill myself. There is no life without you," he writes in one letter. In another, he praises Taylor's acting gifts: "You are probably the best actress in the world, which, com bined with your extraordinary beauty, makes you unique. Only perhaps Duse could match you (Garbo and Bernhardt make me laugh). When, as an actress, you want to be funny, you are funnier than W. C. Fields; when, as an actress, you are meant to be tragic, you are tragic." Burton's playful side emerged in the letters, and his doting nicknames for Taylor are plentiful. He addressed her as "My Lumps," in the rueful letter he sent after they agreed to separate; "Dearest Scrupelshrumpilstilskin," he wrote on June 30, 1970, typing a three-page, double-spaced letter on Beverly Crest Hotel stationery. In another letter he calls her: "Twit Twaddle etc." -- and signs it, "Husbs." "One of these days I will wake up--which I think I have done already--and realize to myself that I really do love. I find it very difficult to allow my whole life to rest on the existence of another creature. I find it equally difficult, because of my innate arrogance, to believe in the idea of love. There is no such thing, I say to myself. There is lust, of course, and usage, and jealousy, and desire and spent powers, but no such thing as the idiocy of love. Who invented that concept? I have wracked my shabby brains and can find no answer." "I have never quite got over the fact that I thought and I'm afraid I still do think, that 'acting' for a man--a really proper man--is sissified and faintly ridiculous. I will do this film with Ponti and Loren out of sheer cupidity--desire for money. I will unques tionably do many more. But my heart, unlike yours, is not in it." "You must know, of course, how much I love you. You must know, of course, how badly I treat you. But the fundamental and most vicious, swinish, murderous, and unchangeable fact is that we totally misunderstand each other ... we operate on alien wave lengths. You are as distant as Venus--planet, I mean--and I am tone-deaf to the music of the spheres. But how-so-be-it nevertheless. (A cliché among Welsh politicians.) I love you and I always will. Come back to me as soon as you can ... "
"I'll leave it to you to announce the parting of the ways while I shall never say or write one word except this valedictory note to you. Try and look after yourself. Much love." Taylor also shares the letter she wrote to Burton following their decision to remarry after their first divorce. "Dearest Hubs, How about that! You really are my husband again, and I have news for thee, there bloody will be no more marriages--or divorces, either. Yours truly, Wife."